TopVintage LOVES Lola Ramona! And thankfully this love is mutual ;-) That's why we decided to collaborate and release this awesome autumn collection! 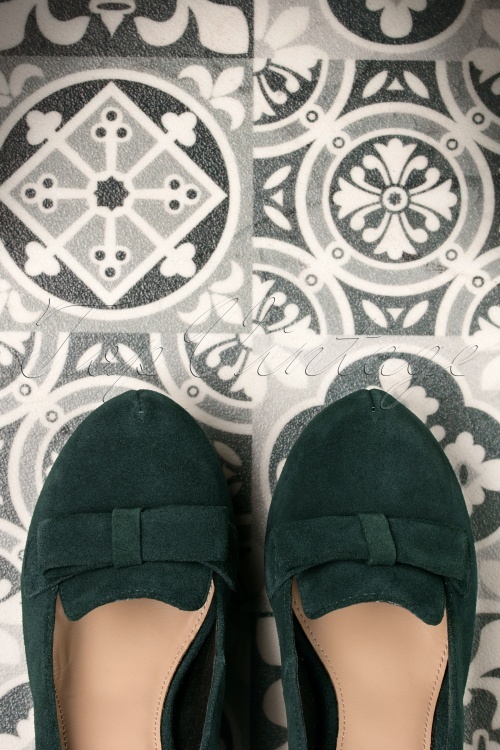 May we introduce the 50s Angie Lift Me Up Suede Platform Pumps in Green? And these beauties will lift you to new heights in every way possible; the handy platform will make you stand taller but Angie will also take your (party) outfit to a higher level! Made of high quality, dark green suede, finished off with an adjustable ankle strap and a lovely bow on front of the pump, so cute! While the sturdy, high heel adds the perfect finishing touch, the combination with the soft insole also makes these cuties a joy to wear! Are you ready to let Angie take you to the top? Ik had al twee paar Lola Ramona's en daar ben ik zeer blij mee: geweldige pasvorm, kwaliteit, anti-slipzool, hippe look... Eigenlijk alles wat je in een schoen zoekt. Het probleem begint als het pantytijd wordt, dan glijden die pumps zo van je voet. Helemaal opgelost met dit paar door de bandjes. Bovendien is het een schoen die niet iedereen heeft en die in het oog springt. I'll be back for more :). Einfach toll. Ich liebe meine neuen Schuhe. Schön und bequem. Außerdem auch noch die perfekte Herbst- und Winterfarbe. Suche schon lange richtig schöne grüne Pumps und endlich sind sie da. Schön verarbeitet und wertig, sehr bequem und ein absoluter Blickfang. Danke für diese Schätzchen.